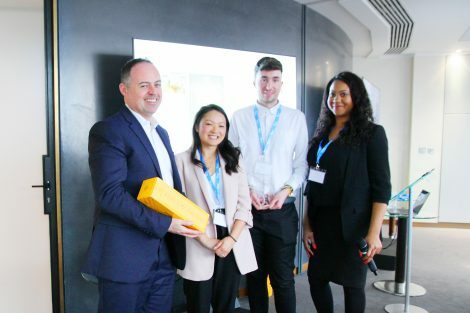 Executive Channel Network (ECN), the UK and Europe’s leading workplace communication specialist this week announced the winners of its inaugural Digital Communication in the workplace awards. (From Left to right; Nick Hiles, Asset Director, Stanhope; Su Truong, ECN; Jason Pye, Head of Events and Enlivenment, Savills; Kareena Bennett, ECN). The event, a celebration of workplace building content displayed across ECN’s London network, was held at The Gherkin and attended by building managers, facility managers, and surveyors from leading UK building management companies. Chris Coleman-Brown, Head of Estates Europe – Lendlease, opened the event by discussing the emergence of the digital layer within the built environment, and its role in creating a more collaborative building community. Richard Blackburn, Managing Director, ECN UK told us “We’re incredibly proud of our creative and responsive customer focus and this event is testimony to the fabulous work our team does on a daily basis to enhance the customer experience in the workplace. A big thankyou to our asset partners for being so supportive of our workplace content model”. Nick Hiles, Development Director at Stanhope Plc told us “We are very proud of the work that has gone into making White City Place the industry leading development in digital communications that it is today, and we are extremely pleased that it is getting the recognition it deserves”. Find out more about the Digital Communication in the workplace awards click here. ECN is the UK & Europe’s leading workplace communications specialist, with offices in London, Paris and Frankfurt. Over 450 European workplace locations have now connected to ECN’s managed content platform, which delivers the latest news and building communication. ECN is a wholly owned subsidiary of Executive Channel Holdings (ECH). This entry was posted on Thursday, March 21st, 2019 at 14:15 @635 and is filed under Scuttlebut. You can follow any responses to this entry through the RSS 2.0 feed. You can leave a response, or trackback from your own site.